Find out why you really need more than one type of secateurs in Tool Time. ; What vegetable is really a fruit and it’s not a tomato in Vegetable Heroes; , plus a exotic plume flower in Plant of the Week and flowers that spell a country theme in Talking Flowers segment with Mercedes. 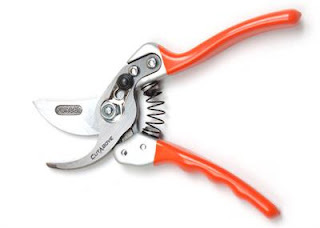 Are you a one type of secateurs gardener? Did you know that you could be doing yourself a disservice by only having one pair of secateurs? Especially if you’re a keen gardener who’s out there most days doing something in the garden even if it’s only thirty minutes. Let’s find out what other types you could use? Anvil vs By-pass vs snips are the three main types of secateurs. The anvil type of secateurs can best be described as having an upper blade that cuts down onto a lower flat area. Much like a knife onto a cutting board. The upper blade can be sharp on one or both sides. 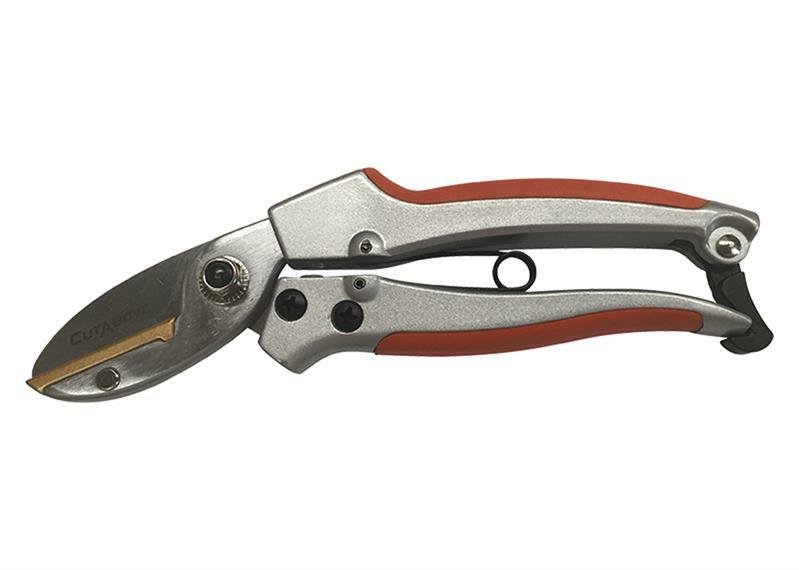 Did you know that the majority of ratchet secateurs are anvil based because they need to be able to cut up to 28 - 30 mm thick branches. These are best for thicker, harder stems such as chopping up branches to go into the compost bin. Good for either either a right hand or a left hander. For bypass secateurs the blade is going past the anvil at the bottom. More suitable for softer plant tissue and using on live wood or plant tissue. Note: only sharpen the outside edge of the cutting blade. Good for sharp, precise cuts. Snips are good for florists and those gardeners that like to propagate plants, as well as for cutting flowers. If you have any questions, either for me or for Tony why not email realworldgardener@gmail.com or write in to 2RRR P.O. Box 644 Gladesville NSW 1675. 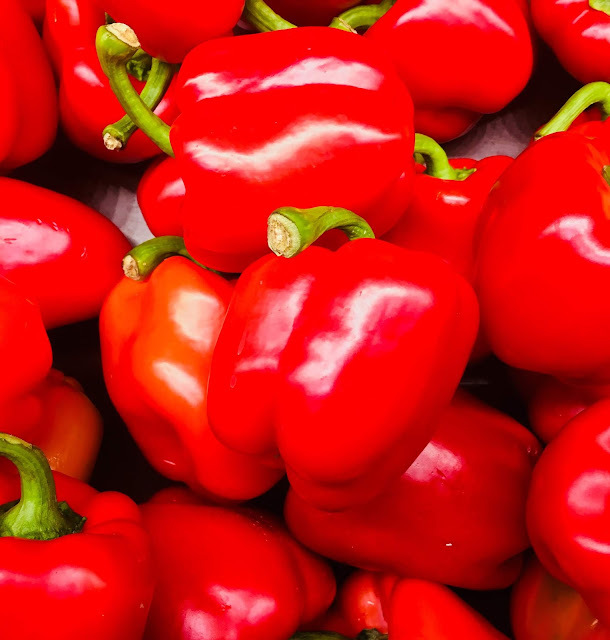 This weeks Vegetable Hero is the Capsicum or botanically-Capsicum annuum or Bell Pepper or Sweet Peppers if you’re in America and Capsicums if you’re in Australia, and Pimento if you’re from Spain. Capsicums are from the Solanaceae family, together with tomatoes and eggplants. So how did they get to be called Capsicums? Probably from the Greek word kapto, which means to "to bite" or "to swallow." You may already know that tomatoes are classified as fruits by Botany, but so are capsicums. That’s right, just like the tomato, Capsicums are botanically fruits, but most people would think of them for cooking and eating to be vegetables. Christopher Columbus of course was mostly responsible for exporting capsicums, along with potatoes to the rest of the world in the 1400’s. Did you also know that there are 30 species of capsicum in the world, but only five of these have been grown in home gardens? All of the others are wild capsicums that still grow mainly in South America, such as in Brazil. Just recently two new capsicum species were discovered in Bolivia. 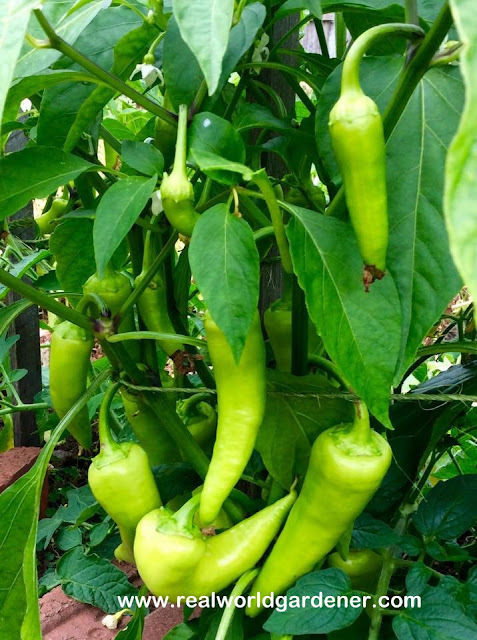 Capsicums grow on a medium sized bush with one or two main stems, mid green pointed leaves up to 1 metre, with little white flowers. The flowers need to get pollinated before capsicums start appearing. Then as the capsicums grow, they change from green through to red but can be harvested at almost every stage. Some of you may have already made a head start on sowing the seeds of Capsicums because they take ages to grow and because of the long lead up time before the capsicum is ready to eat. If you live in temperate zones around Australia, zones you have from August until the end of December to sow the seeds of capsicums. If you live in cool temperate districts, September until November, are the times you start your capsicums from seed, preferably undercover somewhere. In arid areas, September is a good time to sow the seeds under cover, but from then on you can plant them directly into the ground right until next April. In warmer sub-tropical and tropical areas, you can sow Capsicums almost all year, from June until next March. Capsicum seeds may seem harder to germinate than tomatoes but there’s a reason. All capsicum seeds need higher temperatures than tomatoes to germinate-in the 230C to 280C range. For some gardeners, capsicum seeds seem a difficult seed germinate, and even if you’re a gun gardener, seedlings grow slowly. The other drawback is that it takes 70-90 days or 2 1/2 to 3 months for your capsicum to mature, depending on the variety you’re growing. As the bushes start to grow tall and produce fruit, they can fall over causing the stem to break so stake them up using strips of stockings to tie them on. Have you ever wondered about those capsicums that get crack lines in the skin? The fruit of capsicums can grow quite quickly if they’re watered and fed regularly. But, if the soil is allowed to dry out too often or they don’t get enough food, the fruit can get crack lines on the skin. That’s because the capsicum grew quickly, then stopped, grew quickly and then stopped again! These are still edible, they just don’t look as nice. The colour can be green, red, yellow, orange and more rarely, white and purple or chocolate brown, depending on when they are harvested and the specific cultivar. Green capsicums are less sweet and slightly more bitter than red, yellow or orange ones. But they take longer to grow of course, that’s why they’re so much more expensive in shops than the green ones. The sweetest capsicums are those that have been allowed to ripen fully on the plant in full sunshine, while those that are picked when green and ripened in storage are less sweet. After you get your seedlings going, pick a spot in the got that is the hottest-with the longest hours of sunshine. Do the usual by, adding plenty of compost, manure, and a general fertilizer. In cooler districts, transplant young seedlings outdoors after the last chance of frost. If the weather is still cool, delay transplanting a few days, and keep them in a cold-frame, indoors or next to the house. Capsicums don’t like to dry out and actually prefer moist but not wet soil and don’t like extreme changes in the weather. It mightn’t seem important now, but months down the track, water regularly as the weather warms up. When your capsicum plants start to get bigger and small flowers appear, switch over to a fertilizer higher in Phosphorous and Potassium. Something like tomato feed should do the trick. You don’t want just all bush and no plants do you? Occasionally, they will cross pollinate from pollen carried by bees or other insects. If you don’t want hot capsicums, don't plant hot chillies too close. Don't worry though, as it won’t affect the fruit of this year's crop. The cross will show up in the genetics of the seeds, if you save them. Capsicums and chilli peppers are almost identical except for the level of Capsaicin which gives chillies and some peppers that “hot”sensation. Martha has emailed this question about growing Capsicums. Why are my leaves going yellow and falling off? Did you know that compared to green peppers, red peppers have more vitamins and nutrients and contain the antioxidant lycopene. Red capsicums are also rich in beta carotene which the body converts to vitamin A, vitamin E and a good source of folate (one of the B vitamins). One red capsicum contains almost the equivalent of almost 2 teaspoons of natural sugar, which is why it tastes so sweet and delicious. Yellow capsicums are sweet with natural sugars too, but green capsicums have much less sugar, so they’re a little more bitter. 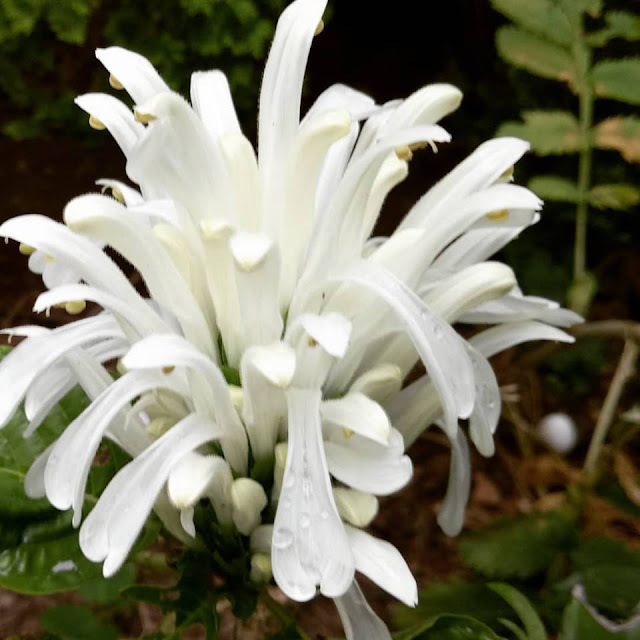 Brazilian Plume Flower: Justice carnea & Justicea carnea "alba"
This plant should be grown more in gardens with it’s tropical looking dark green large leaves and the plume of petals either in white or a sort of cerise pink. But as always, some plants fall out of favour or are just forgotten, and shunned by big box stores that sell a limited range of plants. You’ll definitely want to grow this after you hear why it’s so good. It has large deep green leaves that have deep crinkly veins and are sometimes hairy. Lance-shaped dark green leaves, long up to 20 cm and 5 cm broad, with prominent veins. If you’re plants drops their lower leaves, get a big feed and prune back hard after flowering. Mercedes says that most customers opt for having a country theme for their bouquets when she used to run a florist shop. So what does make up a country theme when you're thinking cut flowers? If you went for something in the cottage garden line, you would be very close to the mark. 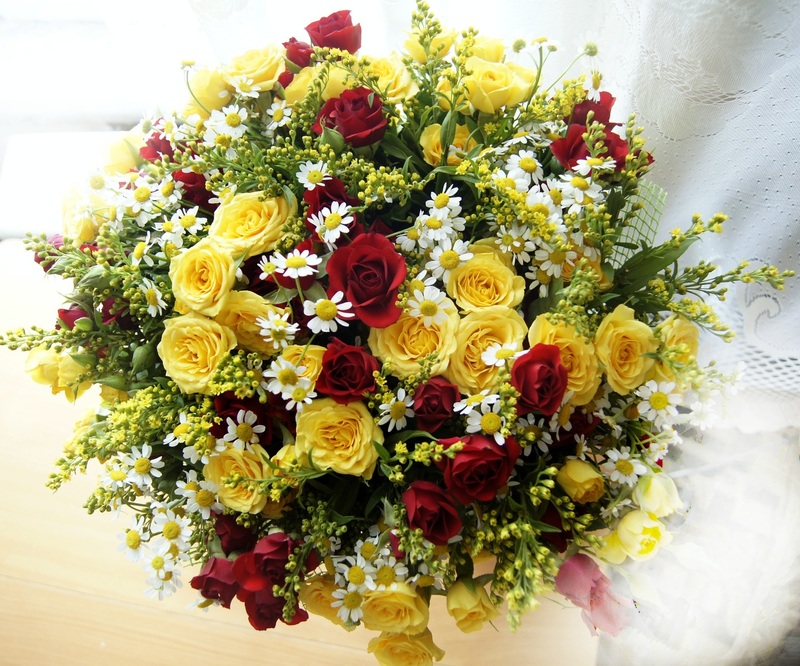 Also choosing flowers from the Asteraceae or Daisy family will make your floral bouquet look like a bunch of flowers you picked yourself, albeit, expertly arranged and presented. The video was recorded live during the broadcast of Real World Gardener show on 2RRR 88.5 fm Sydney.